Take beautiful cover under this stunning Guide Gear by Castlecreek 9 - ft. Market Umbrella! Decorative and functional Market Umbrella shields you from rays and raindrops. Adds elegance to your yard, patio or garden. 2-tiered style in go-with-everything colors of Navy Blue, Hunter Green or Khaki. Gimme shelter: 1-7/8 In. diameter 2-section hardwood pole is secured by brass-plated fittings; Easy raise / lower pulley system with brass pin; Sturdy 8-rib construction; Smooth, reliable, pulley opening; Rugged 180-gram Teflon treated polyester fabric is water repellent and resists sun damage. Umbrella is approx. 7 ft. 9 In. h., 9 ft. diam., 15 lbs. This deal is anything but shady... order yours now! Please Note: The Base is sold separate. 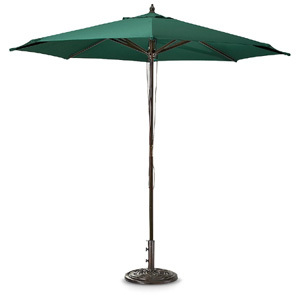 Guide Gear by Castlecreek 9-ft. Market Umbrella. Available in Hunter Green, Khaki and Navy.